Which Is The Best Tablet For Older Person On The Market? Tablets are great for the elderly because of their large screens and ease of use. Unlike smartphones with their small icons and tiny virtual keyboards, a tablet displays words in bigger fonts and it’s much easier to type on them. When you are buying a tablet for yourself, your elderly parent or an aging friend, there are various factors you should consider. We’ll discuss them below. We’ll also review the five best tablets for the elderly which you can buy online. We looked at factors like screen size, weight, interface and battery life to find the best ones. Look for a lightweight tablet that is easy to hold. Most tablets nowadays are extra-thin and light. There are plenty of brands such as the Apple iPad Mini 2 and Samsung Galaxy Tab A that weigh less than half a kg. A light tablet is especially important for an elderly person with arthritis or weak hands. If you have to get a large tablet that’s heavy, make sure it comes with a kickstand so that you can lean it against the table. You can also get a kickstand separately. Something else to check is battery life. Look for something that lasts at least a full day without having to recharge it. This way, the user just needs to plug it in at night when they go to sleep. With light use, it should last for 2 days or more. A bigger screen is better because it makes it easier to see words and pictures on the screen. It is also easier to type on. But make sure you check the weight before buying a tablet with a large screen. It might be too heavy for them. The smallest tablets have a screen size of around 7”. They are ideal if you need something that’s extra-light and easily portable. If the person you are buying it for loves travelling, this is the best size. They can easily carry it in a bag or purse. On the higher end of the scale you’ll find 12 inchers such as the iPad Pro and the Microsoft Surface. These are essentially 2-in-1 mini-laptops and tablets. Though they may be too heavy to hold by hand for long, most come with a convenient kickstand. The ideal screen sizes are 8”-10”. They are large enough that viewing things and typing on the screen isn’t a problem but are not too heavy. They are also small enough to hold in one hand. Also check the display quality. The higher the screen resolution the better because it’s easier to see images clearly and watch videos. Rear and front cameras to take photos and for video chatting. A slot for an SD card in case they need more memory to store photos, videos and music. A SIM card slot if you need to call and message using the tablet or if you can only use cellular internet. Bluetooth. This allows you to connect the tablet to Bluetooth headphones for better sound quality. iPads have always been some of the best tablets. They are easy to use, the battery life is great and they last long. This is a Certified Refurbished product so it’s cheaper than what you’d normally pay for a new iPad Mini 2. Certified refurbished means it is pre-owned but the manufacturer has restored it to a ‘like-new’ status. It’s just as good and reliable as a completely new iPad. Just that it’s cheaper and may not come in an original iPad packaging. The tablet’s display is 7.9”, big enough for someone with poor eyesight. Icons and buttons on the screen are big and easy to use. At just 330g, the iPad Mini 2 is easy to hold even for someone with weak arms or fingers. Its fairly small size makes it easy to hold in one hand. The tablet has 16GB of internal storage space and a RAM of 1GB. It is a WiFi tablet and has no SIM slot. It comes in two colour options: space grey and silver. Compact and lightweight design that is ideal for elderly users. Large and clear display that is easy to see in different light conditions. 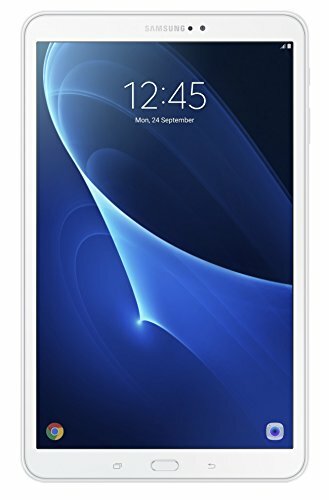 If you need a bigger tablet with more space, try the Samsung Galaxy Tab A. With a display size of 10.1 inches, it is significantly larger than the Apple iPad Mini 2. That means bigger fonts and easier typing on the on-screen keypad. On the downside, it’s a little heavier than the iPad at 429g. But it’s still light enough that most users will have no problem holding it in their hand. The large screen is great for users who are buying the tablet mostly for entertainment – watching videos, browsing pictures and playing games. The resolution is pretty good too. But it’s not all movies and games. The tablet comes with a rear 8mp camera for snapping quick photos as well as a front 2mp camera for selfies and video chats. The 7300 mAh battery can withstand intensive use without draining quickly. On average, it can last a whole day with heavy use and 2 or more days with less intensive use. The tablet comes loaded with Android 6.0 which is intuitive and highly customizable. Note that this is a WiFi-only tablet. It doesn’t have a slot for a 4G SIM card. The internal storage capacity is 32GB and RAM is 2GB. Large screen and great resolution. Slim and lightweight profile that’s easy to hold in one hand. Amazon has not had much success with their tablets compared to brands like Apple and Samsung. That’s not to mean their tablets are inferior. In fact they are excellent options if you are looking for something cheap but good quality. The 8th generation Fire HD tablet is one of the cheapest on this list but comes with plenty of great features. One of them is the high definition 8” display. It’s not quite as big as Samsung Tab A’s display but it’s big enough for someone with less than 20/20 eyesight. It also has two cameras; one at the front for video calls and a rear 2MP camera for capturing photos and HD videos. With a 32GB internal storage capacity, there’s plenty of space to store videos and photos. But if you don’t need all that space, there’s a cheaper 16GB version. The battery life is impressive with an estimated 12-hour mileage of heavy use. Amazon says the tablet can withstand falls without breaking or cracking. It’s perfect for users with shaky hands. The tablet comes with Alexa installed. Alexa is Amazon’s smart assistant. You can ask Alexa for information about the news, weather and general questions. You can also ask her to play music, make video calls and send messages. If you are an Amazon Prime member, you can enjoy thousands of shows, movies, songs and books for free. One of the cheapest tablets you can buy. Hits the sweet spot in terms of size – not too big, not too small. Easy access to Amazon Prime benefits such as movies, songs and TV shows. Comes with Alexa smart assistant. If you are looking for a PC-like tablet that’s good for watching movies as well reading and editing documents, the Microsoft Surface Pro 3 is great. It’s the most expensive tablet on this list but it’s worth it if you are looking for something powerful and versatile. It is 12” is size and weighs over 1kg. But at least you don’t have to always hold it in your hand. You can use the kick stand to lean it against a surface like a PC. This is handy when you are typing on the screen or watching a movie. The tablet is loaded with Windows 10 Pro. It’s easy enough to use though not as intuitive as a mobile-first OS such as iOS or Android. The display is very clear with colours looking bright and sharp. Whether you are working or playing a game, the tablet is fast and responsive thanks to the 128GB SSD and 4GB RAM. Ideal for those who want to replace their PC with something lighter and more portable. This is another good option if you are looking for something cheaper but good quality. The MediaPad T3 WiFi tablet comes with a 10” display (9.6” to be specific), 16GB internal memory and 2GB RAM. As the name suggests, the MediaPad is designed to deliver a great experience when watching movies and TV shows. The HD resolution delivers vivid colours and the sound is not too bad either. The thin profile makes it easy to hold in your hand. If you need to type or read a document, the tablet is pre-loaded with all essential Microsoft Office applications. It comes with Android 7.0 with plenty of customization options available.